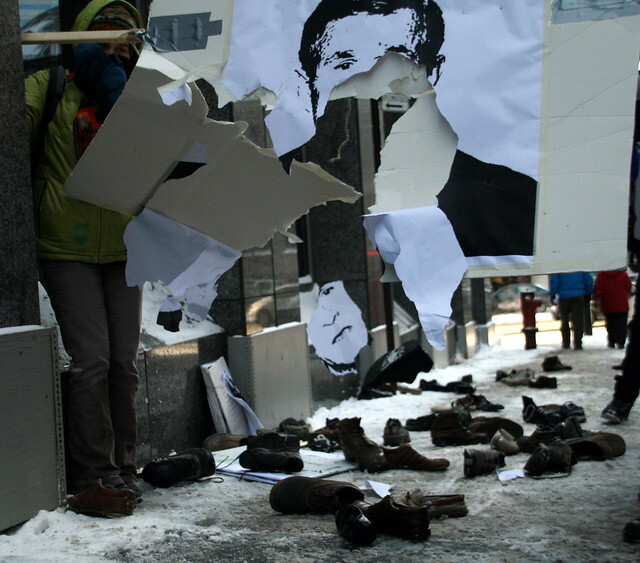 Protesters Throwing Shoes at Bush posters in Montreal | Flickr - Photo Sharing! 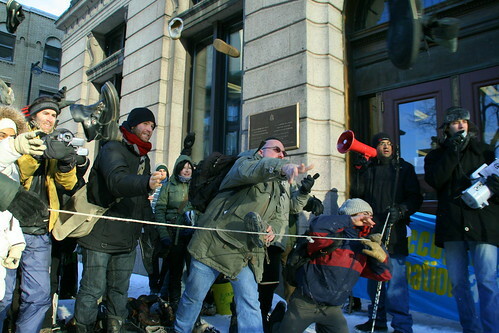 Flying shreds of paper after shoes were hurled at the poster of President George Bush outside the US Consulate in Montreal, Canada. 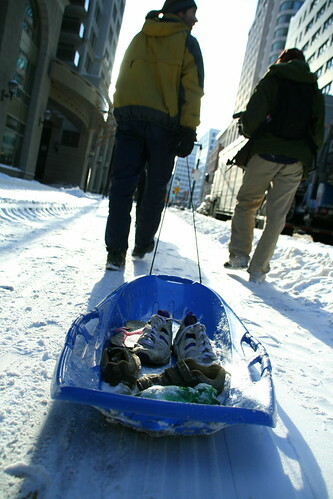 People went out in freezing -24 C weather to show support the Iraqi journalist Muntadar al-Zeizi (from the Bush Shoe incident). Was walking on René Lévesque Boulevard and spotted a big crowd on St-Alexandre Street, almost half comprised of TV & press journalists. Apart from the demands of getting troops out from Iraq and Kandahar (Afganistan) and releasing the journalist, the protesters politely requested to release the pair of 10-sized Ducati Model 271 Turkish shoes back to its rightful owner. "We support the calls for al-Zeidi's immediate release from detention, and denounce his abuse while in custody. And, in a simple gesture of solidarity by local anti-war activists and independent media journalists, we will gather outside the US consulate to hurl shoes in continued opposition to the US occupation of Iraq, as well as the already announced escalation of the US military occupation of Afghanistan by the incoming Obama administration (a continuation of "Operation Enduring Freedom", launched by George Bush after September 11, 2001). We also continue to oppose Canada's complicity with the US-led "War on Terror", with the Canadian Armed Forces' military presence in Afghanistan. More Canadian troops in Afghanistan has effectively meant that more American troops have been available to occupy Iraq." New-Addiction, fiume2008, houtlust, and 3 other people added this photo to their favorites. Thank you for releasing this shot under CC license. Just wanted to let you know I've selected to display this image at 'Bush Shoe' news page (it's my hobby site), full attribution and link to you is provided. Thank you once again. Hi, I'm an admin for a group called lo que mas nos gusta.., and we'd love to have this added to the group!